The team at Cox’s was reunited with a traditional Broads’ wooden sailing yacht it originally looked after back in the 1980s and 90s when it recently undertook comprehensive repair and upgrading work on Cirrus. 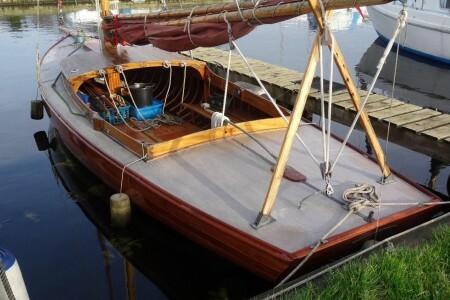 Built back in 1934 by Ernest Woods at Horning, Cirrus was originally one of a series of 21-foot (6.32-metre) wooden ‘Gentleman’s Day Boats’ and has had several owners over the past 81 years. By the time the current owners acquired it in summer 2014, however, it had fallen into a state of disrepair, so they decided to ask the experts at Cox’s to help restore it to its former glory so that they could enjoy many more happy years on board. They are certainly delighted with the result! The renovation work took about three months and Cox’s began by removing the old electric motor that was in place and then carefully replacing over 150 feet (46 metres) of mahogany planking, followed by 60 timbers with brand new oak. 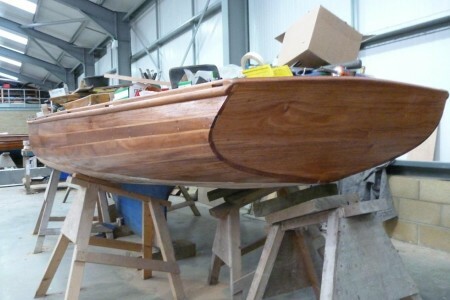 The hull was totally stripped back to bare wood before being re-coated with epoxy varnish, and a new transom, floor bearers and new floorboards were fitted. This is a phased restoration project, so next year Cox’s have also been asked to carry out deck and cuddy work.